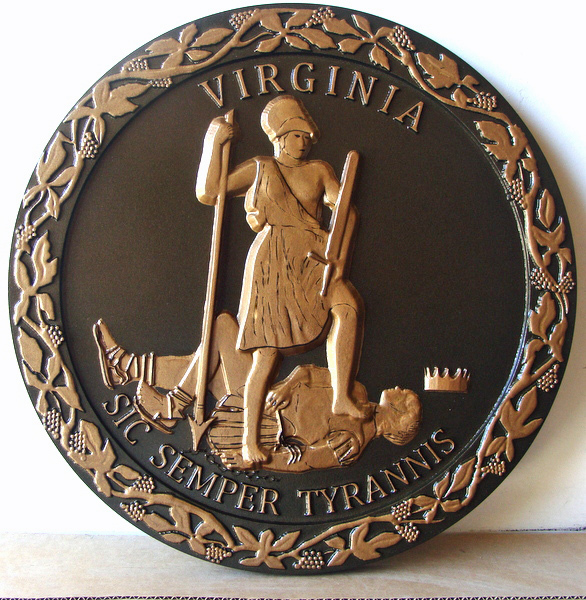 Above is a photo of a painted 3D carved bas-relief HDU Great Seal of the State of Virginia. Metallic Bronze paint was used for the text and art, and a dark brown paint simulating patina was used for the background. Other options for this plaque were a brass metal coatings and gold-leaf gilding for the text and art. Both of these latter option would have higher prices. Shown above is a metallic-gold painted 3D carved High-Density-Urethane (HDU) wall plaque, for the US House of Representatives. This plaque is 24 inches in diameter, but can be purchased in any size from 16 inches to 60 inches in diameter. It can also be customized with other text, including a Congressman's or Committee name, or other artwork.